Then he noticed something positively strange — April 14th in 1915 and one year later in 1916 looked almost identical, as did the same day in 1917. The more he looked, the weirder things got. He plodded, year after year, all the way from 1911 to 1917, then through Jan, Feb, March, and so on. Worse, he tells me he could keep going right through to 1956 without seeing much change (though there are interesting exceptions). After that, temperatures of the area start to vary from year to year, like the “weather” we’d expect if we had multiple thermometers in the site with the black square, which we still don’t have. Even in the modern era there are only two sites. It is not just ”April 14ths” each year that are suspiciously similar, it’s pretty much all days of the same month. In this blockbuster graph below, he looks at one spot in central Australia, about the size of Tasmania (which is 65,000 km2), and tracks the temperature profile of that same area, on the same day, year after year. The BOM tells us they have good temperature records. They tell us the AWAP analyses are based on “in situ” surface observations, and they make much about AWAP trends being “unadjusted“. Yet here in an AWAP Map, presumably derived from the same data as those “unadjusted trends” there’s an area with no thermometers before 1940 (when Warburton opened) and we see detailed temperature lines that are identical year after year. Do AWAP maps and AWAP data matter? AWAP maps are used in press releases and in the news. The detailed wiggles send a message to the world that “we have very accurate data”. But when the BOM tells us we set an “area averaged” record across the whole of Australia since 1910, they don’t mention that it’s compared to “calculations” of estimated wiggles over hundreds of thousands of kilometers where there are barely any roads, let alone thermometers. Nor do they mention that suspiciously, magically, in the early part of the AWAP record the temperatures in remote central Australia appear to be the same year after year — or at least they are in the maps*. Significantly, the BOM use trendlines from the AWAP data as justification that their all-homogenized ACORN data is virtually the same as the “unadjusted” data. It’s their excuse for why their massive adjustments in the ACORN set look neutral (when other analysis of ACORN shows the adjustments that warm the trend are much more common). The AWAP maps are created from this data too (but obviously the maps themselves aren’t “raw” because they must have an area weighting algorithm run over the data, plus elevations, plus who knows what else?). The question then is what is the state of the AWAP “unadjusted” data? The maps generated from it suggest quality control is awful, weekly data disagrees with daily data, and the program used to do area-weighting and to generate the maps is not producing results that look credible. How “unadjusted” are the trendlines that are called “unadjusted”? Below Lance Pidgeon has graphed the squares that fit in the black box in central Australia (shown in the map below this) from Jan 14th each year, then Feb 14th, then March 14th… you get the picture. Astonishing. Thank citizen science for telling you what the BOM doesn’t mention. 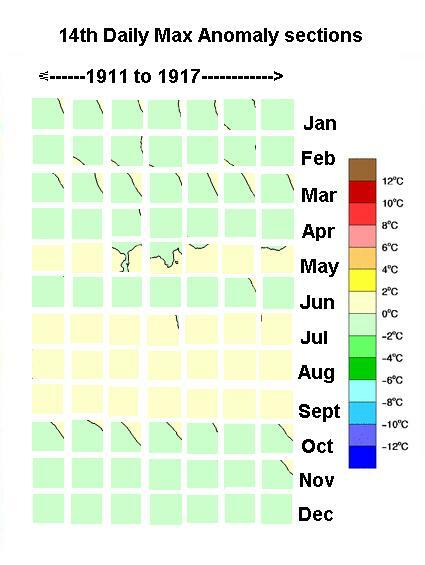 Year after year on the same day of the year, the temperature patterns are identical? To produce an area averaged temperature for Australia a fine matrix of squares on a map can be used. Just add the values in the squares and divide by the total after correcting for latitude. Anomalies and trends can be produced over time. Simple right? The BoM “Australian Water Availability Project” (AWAP) maps have a fine lat-long grid over many years of daily data. But in parts of Australia thermometer sites are hundreds of kilometers apart, especially in the first half of last century. To make a complete picture gaps need to be filled — but with what exactly? Between thermometers MUST be derived values. Does the fill come from raw data, estimates and future averages or a desired outcome? Is the gridded data that was used to generate this map called “raw” data by the BOM? In the map below, we’ll take a close look at the area marked by the black square. Horizontal lines drawn from the same island in W.A. shows two mapping methods. Pasted squares in the graph pictures have been chosen to show a problem that would effect the whole map to some degree. Tasmania is about the same size as Ireland, Switzerland or the state of West Virginia in the USA. These maps can be found here. Select the day, month and year etc from the drop down menus. Thermometer location map: Each dot currently has a site. There are more dots if you tick the box for “closed” stations. Early 2014, long before all the data had been Q.A. checked, the BoM and ABC were quick to hit us with headlines. Long stretches of hot weather, with little respite at night, have combined to make 2013 Australia’s warmest since records began over a century ago. The ABC quoted the BoM, repeated the long time span and used AWAP maps as a display of evidence. Is it evidence or art with a desired outcome? The Barnes analysis technique has a number of advantages, including being efficient, robust (coping with strong gradients and data voids) and highly tunable. Jones and Trewin (2000a) have previously shown that the accuracy of this method is similar to that of more sophisticated techniques, and avoids some of the weaknesses such as extrapolation of unrealistic values into data voids and the dampening of variance. Bold mine. Oh and why is it important to “avoid” “unrealistic values”? homogenised ACORN-SAT and unadjusted AWAP datasets for Australia. Bold Mine. That does not explain where either the underlying value or repeating step sequence in anomaly came from. See below. 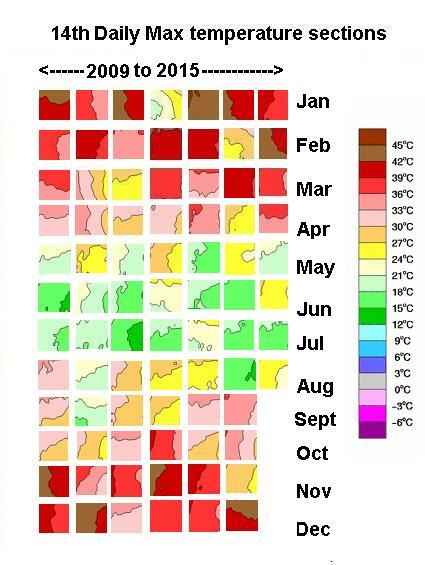 Below are colour patterns from approximately the same place as the black square on the maximum temperature map above for the 14th day of the month and year. The first picture has sections from maps of a time before weather station sites opened at Giles, Warburton Airfield, Blackstone Range and Yowalga. The second picture is from recent years. The difference is stark. In recent years the weather is different year after year. In past years, not. A tad “unrealistic”? Exceptions are mysterious when the “hottest” day of the week is not the hottest day that week. During one interesting week in 1943 ending on Feb 16, the highest maximum temperature recorded across this same area of Australia was between 36 and 39C. Check individual days that week, like the temperature of February 14 and thousands of square kilometers recorded a hotter maximum of 39 – 42C in the same area of central Australia. Yes that’s right. In that location, February 14 that year was hotter that itself. Is anyone silly enough to defend this rather than wanting it to be fixed? An overlapping half square step to the left (i.e. West) from those above, we see a yearly square step sequence in anomaly through the months on the earlier sections below but not on the more recent sections. This step sequence could be related to the similar mysterious square wave adjustments found in ACORN by Bob Fernley Jones. Jo asks me “What does raw data mean anyway?” and “why bother with real stations”? “Oh but the colours in the later section pictures may be somewhat influenced by real data.” I reply. Though I concede the squares in the earlier ones are more like God playing tricks on the BoM. So far we have been able to deduce that the data in the earlier squares is produced using the F.A.K E. method but are unable to determine what F.A.K.E. stands for. Theories include “Fecalithic Absentaneous Kenophobic Esemplasy” and “Fast Autogenerated Klimate Estimates”. The assumed Squiggles BoM colouring in group may also enjoy square dancing on a grid after a little nap. Jo says: We laugh, because if we don’t laugh, we cry. Thank Lance for the hours of research it took to find and put these graphs together. The Bureau of Magic’s budget is $300m +. Lance gets no payment. *Edited — added “remote central Australia” to clarify. Why bother with real stations indeed. Sort of like trying to explain the Universe with dark matter and dark energy making up some 95% of it yet we have no means to measure them, assuming they exist, which they probably don’t. Science is now pseudo-science with magic. Where is the Wizard of Oz? You may find this bizzare interview interesting. The interviewer has strange ideas that make little sense but the interviewee Konstanin Meyl makes sense with stranger ideas. Regrettably, we are now subjected to the wizards of homogenization; inherent in the BoM. The Wizard of Oz is hiding behind his curtain and using that booming voice to frighten the natives. In real life, there’s no small dog to pull the curtain away, and even if there was, a tragic accident would beset the critter. The booming voice then returns and all is well. This idea of government adjustment and falsification got me to thinking. In the US, Volkswagen will face congressional hearings, very public, for falsifying emissions data. I wonder if a clever lawyer, noting the role of the EPA in measuring data, could gain points by pointing out the US EPA, NOAA, and, for that matter the responsible British and Australian authorities have no problem concocting “data” and “adjustments” to meet publication needs. VW was simply programming to meet a “test” that itself was based on false or contrived data. From “lives saved by regulation” to something as basic as temperature, it is fundamental practice in our agencies to simply make stuff up. A fake program was required to meet the measurement requirements of a rubber ruler. With billions at stake, I’d throw everything possible at the wall in hopes that something sticks. Wizard of Oz, meet Wizard of Id, on the Isle of Mann. One can only manufacter numbers if they are in line with the green agenda and the government policies. Inventing numbers to circumvent these regulations is wrong. Inventing numbers to allow more reguations is okay. Also, it was a greedy corporation that cheated with the pollution regs, not the ever benevolent government who only cares about what is best for you. Let’s hope copies of these records are being kept so that if the day ever comes when we get a conservative government that has the courage to be a conservative government, the records can be used to take appropriate action. Sorry, but tu quoque arguments won’t fly. Warmists are stupid, but they’re not that stupid. Okay, yeah, some of them are. Well, all right, most of them are. But a court is unlikely to fall for this fallacy. Oh, wait, the US Supreme Court recently fell for a load of poop. Hammer on the table, VW. Volkswagen has just admitted to selling nearly a half-million diesel-powered cars in the USA that don’t comply with US Environmental Protection Agency laws. “I personally am deeply sorry that we have broken the trust of our customers and the public. I hope he consulted with his US engineering and legal teams before confessing, because this has happened before in the USA and in 2001, heavy truck diesel engine makers secured some real-world emissions testing concessions from the US Justice Department and the EPA. This real-world test revision process started in 1998, when Caterpillar, Cummins, Detroit Diesel, Mack, Navistar-International, Renault and Volvo were found guilty of violating the US Clean Air Act (CAA) by using electronic fuel injection software that ‘defeated’ emission controls. This is exactly the same offence for which VW is being pilloried at the moment. ‘Defeat’ software alters an engine’s pollution control equipment, allowing the engine to meet EPA emission standards during specific testing, but modifies the emission control system during normal driving. Such an engine ‘knows’ when it’s running on the EPA’s 20-minute Federal Test Procedure cycle, but when the engine is running on the highway, it can produce higher nitrogen oxides (NOx), hydrocarbon (HC) and particulate matter (Pm) emissions. The CAA prohibits a manufacturer from selling a motor vehicle engine equipped with a device designed to defeat the engine’s emission control system. Back in 1998, US engine makers agreed to spend a collective one billion dollars to settle the pollution charges, including an $83.4 million civil penalty. In addition they agreed to comply with stricter environmental requirements that were brought forward from their original scheduling. However, the engine makers set about gathering enough real-world test experience to counter-sue. In 2001, five separate lawsuits were filed against the US EPA by the US Engine Manufacturers’ Association (EMA) and several individual trucking industry entities that made engines in addition to trucks, including International Truck and Engine Corporation. Each of those lawsuits challenged the legality and technological feasibility of certain engine emission control standards in EPA regulations. These standards were called ‘Not-To-Exceed’ (NTE) requirements. In its challenge, the EMA stated that to determine whether an engine meets a primary emission standard, engines were tested and assessed using the standardized Federal Test Procedure 20-minute emissions laboratory test. NTE, in contrast, had no specified test procedure and applied over an almost infinite number of test conditions. This, in the engine manufacturers’ view, made it impossible to ensure total compliance with NTE requirements, because there was no practical way to test an engine under all conceivable conditions. This allegation challenged the legality of NTE. Heavy diesel engine makers proved the point that in light-engine-load and light-accelerator situations, low brake mean effective pressure (BMEP) made piston-ring oil control very difficult, causing inevitably higher burnt-oil, hydrocarbon (HC) emissions. As a result, the EPA had to modify its NTE parameters to allow for real-world driving conditions. The original NTE engine emissions graphs were redrawn, with ‘carved-out’ sections that allowed for transitory higher emissions in typical on-road situations. VW needs to read the 2001 court rulings, I reckon. Senator Sessions was questioning EPA boss Gina McCarthy in Senate hearings in reference to EPA rules which will cost Americans dearly and of course make no difference to the climate. McCarthy refused to accept that there had been no warming for 18 years, less hurricanes and no rising seas. A group of past EPA bosses refused to support Obama’s recent climate claims trying to boost the Paris conference. Perhaps they are using the same techniques to plot “Dark Matter” as temperature. The hypothesis of dark matter and dark energy seems not to be falsifiable on the basis that the matter or energy in question cannot be detected, by definition. Dark matter and dark energy were invented to make up for calculation errors in their models. That their made up dark energy and dark matter are alleged to comprise 95 of the total matter in energy is astounding! Are the astrophysical models off 95/5 = a factor of 19? What percentage of 95 is 5? (5/95)x100 =5.26%. That is either made up nonsense or another huge modeling scam. Dark matter was invoked to explain galactic rotation curves, on the assumption that Newtonian laws hold at cosmic scales. Dark energy was invoked by cosmologists to explain the expansion of spacetime in the universe. It is that simple. ”News.com can pour on all the propaganda it likes, but it will do no good. BoM dropped the hot potato of their old HQ temperature series after it was shown without doubt that they had applied cooling adjustments to pre 1950s data without supporting metadata. They rushed out their new ACORN series, but homogenisation procedures were found to produce station records where daily Tmin for some stations exceeded Tmax where no such thing was seen in the raw data. Later they had to admit the ACORN reconstruction could not be independently replicated by other scientists. If it can’t be independently replicated it’s not science. Now sceptics find that that BoM AWAP data, supposedly “raw unadjusted data”, for records before 1956 appears to be largely computer generated. I am sorry but I don’t see what they hope to gain with their made up and adjusted data. Maybe they think the population are so gullible that they can sell this work of fiction but I still don’t see the why. It now looks as if the green blob were the ones that had Abbott removed because his proposed investigation of the magic department would have exposed all their tricks and that wouldn’t have gone down very well in Paris, even if there was only a hint of fiddling the books. Possibly to make the present warmer than the past, which sees Australia overheating while at the same time the US has been cooling for more than a decade. I thought the US had also been adjusted? Its impossible to make a rational judgement on the whole BoM business, but I am positive Hunt will live to regret this cover up. Yes the USA has been adjusted. Thanks gai, I’m now convinced its a universal conspiracy. Reading through the comments and found this, you can see the trail taken by the first humans into the American heartland. Ivan I am also moved by notions of trying to discover a motive. I, like you cannot see the “motive” other than the easy and probably correct choice of ensuring funding by contriving a dilemma they can pretend to participate in “fixing”. As to the first part of your statement, that is where it gets truly weird, because not only would it appear the public are indeed that gullible. It would also appear they are prepared to take information from authority (ABC and the like) and simply fix their beliefs and assessments around these simple messages, often to the point of becoming rabid defenders of the faith based on nothing more than a few sound bytes of alarmist nonsense. I have just sat down after having dinner with some new friends. A Pharmacologist and a Civil Engineer/Commercial Risk Assessor. A lovely couple, really nice people. After a few wines the conversation turned to politics and climate. They asked me from my experience in wind farms “why arnt we building more?”. I gave them the basic Tony from this site, cold maths assessment and as usual they had absolutely no idea of the farcical generation and efficiency numbers that truly underlie wind power. They had very strong opinions supporting renewables that I completely turned around in about 10 minutes and not only that, they felt genuinely misled (as they indeed have been) to hear the alternative and obviously more sensible numbers that underlie actual comparisons between fossil and renewable energy systems. So to cut a short story long, for various reasons, it would appear that people are indeed either that gullible or that missinformed that they simply take the BOMs data as gospel. The ABC itself has argued in these words that they “should not have to verify data from organisations like the BOM”. So what chance is there for an independant assessment when that is the attitude of the gatekeepers of national science communication. The people delivering the messages are utterly captivated by the green blob. The ABC has shifted clearly from the left to the extreme eco left in the last few years. Its pretty obvious they are now if not anti Labour, they are certainly ambivalent toward Labour. Listen to any ABC radio or TV report and see how long it takes the words “environment” or “climate” to come up. It doesnt matter when you turn on, or what show you listen to, it will be a matter of minutes before one of those words is used. Its so transparent they are not even trying to put a gloss on the bias now. What chance does a general public trying to understand the issues have in that “environment”? And to keep the Matrix theme going. “Many of them are so inert, so hopelessly dependent on the system, they will fight to protect it”. Too many gray areas. Global warming has run on presenting data with far more certainty than is actually there—95% certainty or more according to the IPCC. More funds for more research would also call into focus the lack of data and the overcertainty. If this had not been presented as absolute, more data would have been okay. As for the gray areas, I suspect that anyone looking at missing data would very quickly surmise that this is not based on global data. Even if I accept the 95% confidence interval, it doesn’t follow that “something needs to be done”. My favourite example of why not is from epidemiology, which I have posted before, but bears repeating. Assume we have a test for a disease that is 99% accurate – that is to say, if we administer this test then, on average, it provides the correct answer 99 times out of every 100 tests. Further, we will assume that this test has specificity of 1.0 – that is to say, it tests ONLY for this disease. Further we will assume that the error is non-biased – that is to say, when it returns a wrong result, it is equally likely to be a false positive as a false negative. BTW, this would be an extremely good medical test – most medical tests have accuracy and specificity of less than 0.5 and are biased in their errors; hence the reason your doctor normally asks for several different tests before embarking on expensive and/or risky treatment – but I digress. We now take this test and administer it to a random person on the street. The test returns positive. Given the above information, what do you judge the chances are that the person we tested has the disease? Most people will say “99%” – and they would be wrong, because you do not have enough information to make that judgment. In order to know the real answer, we also need to know one more piece of information – how prevalent is the disease in the general population? Let us say that this disease is relatively rare – 1 in every 10,000 people in the general population has it. So now you know that, does it make a difference to your estimate of the likelyhood of the person who tested positive having the disease? if we have a perfect sample of 10,000 people – so 9,999 are free of the disease and 1 has it – and administer 10,000 tests, we will get (most likely) 101 positives. But we KNOW that only one person has the disease. Therefore, a positive test gives much closer to a 1% chance of having the disease than a 99% chance. And THAT is the value of statistics – a non-intuative answer that is, once explained, obviously correct. Now NONE of this even begins to touch on the many things that can and should affect political policy other than the mere fact of an issues existence – cost-benefit, opportunity costs, political reality, democracy, freedom etc. These others are judgement calls that vary from person to person and have no objective “right” or “wrong”. So even should I accept that your 95% confidence is accurate, and even should I accept that therefore there are risks, it does not follow that I must agree that we need to do something – one does not pay an insurance premium greater than the maximum loss possible, especially when the odds are not 100% the event will happen, and most especially when the chances of the event causing maximum loss are also not 100%. As in most situations in life, one needs to weigh various risks and make a judgment call, then live with the consequences, be they good or bad. Global Warming is the dominant paradigm at the moment and anything we say will be ignored. The masses have been misled and only a serious change in the weather, towards a cooler regime, will snap them out of group think. “Maybe they think the population are so gullible that they can sell this work of fiction but I still don’t see the why”. Unfortunately it is our mainstream politicians and media that are gullible. For instance today the federal environment minister The Hon Mr Hunt proudly boasted on our national taxpayer funded radio broadcaster, (the ABC) that he prevented a proposed enquiry into the Bureau of Meteorology (BoM) on the grounds that it was unnecessary because it had been regularly audited for quality and was rated as amongst the best in the world, (if I can paraphrase). However, the latest audit covering vast amounts of information over the last 104 years consisted of the BoM briefing a panel of mostly statisticians before lunch one day, and then a Q&A after that tax payer funded lunch! Note that the ABC provides an email address to advise them of additional information, as I have done. The motive is very straight forward. Science is a god and science runs on numbers. The more numbers you have, the more truth there is in the Science. To admit you have no numbers would be blasphemy. So the numbers are “estimated”. Sounds scientific and few actually understand that “estimated” in temperatures means made up entirely. Science continues to reign as supreme authority and few would dare question. Those who do questions are just heretics anyway. What they gain, and motive, derive directly from UN Agenda 21 where it was laid out. $200 Billion Per Year in climate reparations to be paid to the UN for “redistribution” and Climate Justice with no small part ending up in government and UN folks pockets along the way. USA and China just announced a $3 Billion starter on it. They then sold the deal to the WMO and on to Meteorology Offices globally who have had massive funding and grant inceases in the following decades. They hoped to show that the “real, not adjusted data” agreed with the ACORN data and thus all their homogenization, adjustments, and modeling errors were insignificant. So now we have dark climate and dark weather? This probably never happened either, 117F in Melbourne at 8 am, Feb6, 1851. BB (Before BoM). This is great BECAUSE it involves visuals which the public could easily relate to. One of the problem in explaining how public money is being taken by opportunists is that the public goes to sleep when they hear any explanation regarding the CAGW Scam. Asking them to contrast the two types of record, made up and real using the visuals is easy. Even i can see that the old “madeup” daily change s all look the same whereas the individual “modern” ones are separate readings. KK I believe the staff hired for the BOM’s AWAP project are all afflicted with Projecting Synesthesia and Associative Synesthesia, this is the only logical explanation for the subliminal channelling of Pablo Picasso where basic graphs would have sufficed. Well I hope that the Public can relate to all those visuals. The more I looked at the key colour images the more confused I became. It’s actually a Stereogram image, If you stare long enough you can see an ACORN. Pity they used abstract art when we really need another renaissance for the lost art of empiricism. But Kevin Hunt said that the BOM is the best of its kind in the world and these things don’t need auditing. He has degrees and god knows what all, a very clever man. I’m just an idiot looking for a village who can’t wait for my next voting opportunity. Whoops, sorry it’s not Kevin (a la Rudd) but should be Greg Hunt I now think. Just like our Kevin Hunt approved temperature records, near enough is good enough as long as you know what you meant. Greg Hunt has acted like a real Rex Hunt, it’s normal to try and forget him.. I know I said I’d emailed because the item didn’t fit current threads at that time but it can’t be too O/T for one like this! Humour is welcome here today. That bit is where Lassiter’s Reef is, isn’t it? How do we know there are any temperatures there? The maps are an approximation. This was brought up in a previous article, and I explained it then as well. The BOM describe the shading process. You cannot imply from this errors in AWAPs. Harry nothing you have said on this matter makes any sense apart from where you contradict yourself. The link you posted has been provided above TWICE and even quoted from. Please read and think before commenting. Then check that what you have written makes sense. If you think I am wrong, say where you think I am wrong and why I am wrong. I know why you got the result you did, it is because you cherry-picked an area out in the desert for years when there was no much good data – this means the estimate calculated by the algorithm in that area does not change much. You used the years 1911-1917 which is the oldest records the BOM draws the map from. If anyone cares to look at the REST of the map on those days, you will find other areas of the map DO change. Also the red shading is for a 4C range (36C-39C) which is a pretty clunky range – if the range was smaller, I expect more variation will be seen. So your claim of “fake” is without merit. All you have shown is the estimates are rough where the data is sparse (duh) – no mystery they say that in the study. When the amount of data increased in the 1950s the estimates become more accurate. Yes Harry now you begin to get it! The site and time as explained above was chosen carefully to show a problem. in parts of Australia thermometer sites are hundreds of kilometers apart, especially in the first half of last century. To make a complete picture gaps need to be filled. Yes that is EXACTLY what i did to show a problem in it’s purest form. It is a dirty slimey accusation trick you are using to infer that it is somehow wrong to cherry pick in this context. That the cherry picking was deliberate and required for explanation was further explained. Pasted squares in the graph pictures have been chosen to show a problem that would effect the whole map to some degree. Calling this “chery picking as if it were somehow the wrong thing to do demonstrates that you are sooping to desperately deceptive argument techniques. Is your calling the BOM “fake” also a “dirty slimey accusation trick”. My point is your analysis has no value, you just confirm what the BOM says in it’s documentation. So a question is WHY did you even bother to do this analysis? Why do you even bother posting ? You have NOTHING to contribute to rational discussion. You realise of course that this “approximation” is being used to form precise national and international economic and social policy? HTO in praise of “the science of exact approximations”? Unless you care to elaborate your claim? There is little difference between the words estimation and approximation. As the BoM boast here all 18 of the examples shown are estimates. Interesting that the “approximation” changed so dramatically. Looks more like a wild guess trying to be passed off as science. Definately a wild guess based on the dramatic nature of the changes of the “approximation” graphs. Why bother to graph at all, anyway? Just put out the data and call it good. Wait, that wouldn’t rope in people based on maps of guesses, would it? Yes Harry. When the BOM want our money they are 95% certain, but when we want answers “it’s only an approximation”. The BOM have probably gotten tired of explaining things to people who do not want to listen. Professional science organisations have to deal with cranks all the time, they have better things to do. Not sure where you get this “95% certain” figure from, please provide details. Or is it more of your “satire”? Actually any defense from you of the articles you post would be welcomed. If you go around calling people names you can expect the same treatment. I think I know you, you approve the approximations that Kevin Hunt authorises. So what we have is a data set historical temperature anomalies. So if we look at the historical temperature data sets we decided, well, Harry, and me, and BOM decided, that high temperatures in a hot area wasn’t the anomaly because it just made the current temperatures seem cooler in hotter places, so we looked at historical low temperatures in hot areas, now that’s the true-anomaly we found – so we merely adjusted all the other historical records down to match the low-temperature true-anomaly data sets – Harry confected the algorythm and I called it the Gilligan’s Hammock because I loved it the time Gilligan used the professors sea level measuring stick to tie off his fishing lines, right. Now, once the cooler true-anomaly was fixed we then then looked at the current data sets and found that by comparing these with the downward adjusted true-anomaly then the current data sets that once showed cooling in warmer areas now reflected warming simply by making those historically warmer areas cooler so we could show hotter true-anomalies in areas that were once hot, but are now cool. We always wonder what you are talking about..
…idiocy is hard to fathom ! My reply to Harry above may appear harsh but surely anyone who tries to decihper even the shortest of his comments would get lost in the illogic. For example. Harry says “The maps are an approximation.”. Google defines this word “a value or quantity that is nearly but not exactly correct.” So Harry implies errors of accuracy. Then says “You cannot imply from this errors in AWAPs.” So he can imply errors but I can’t? However and as usual what he has written can be taken multiple ways. The word “this” in that line could have had at least three possible intentions. 1) This meaning the approximation. 2) This meaning the link he provided. 3) This meaning the cut and paste charts and entire post. He has also used “AWAPs”. The s makes it plural. Is he saying there are multiple projects? Is he saying there are multiple outputs of the project(singular)? Is he saying that the AWAP maps are something different to what ever he is refering to? He says he explained something but does not clearly say where. He says the BoM explain the “shading” process but the document he links to does not use the word shading and the maps are coloured not shaded. Others have reacted to the general gist of what he may be saying but I would rather he made his point clear and unambiguous. Anyone can see that the value steps between colours is large but this should have been generated from numbers that add up and have some accuracy relative to real, nearby, one decimal place temperatures on the day. My conclusion is that it while it may be worth attemting to figure out what Harry is saying, it may not be possible. Actually, “shaded” is the term Jo Nova uses in her article. Fair enough point Harry. She did. Serious about my comment? Yes. The maps are an approximations derived from the AWAP data set. They are estimates. The way they come up with the estimates is described in the paper. They could have laid out a grid, but they decided to take an artistic approach like a lot of weather maps. The way they shaded the temperature differences in the map won’t affect any of the actual measurements, or averages and trends calculated from the actual measurements. On second thoughts, I change what I said above. The “squiggly” bits might be related to an adjustment in the maps for altitude. Harry read what you are commenting about before you comment then you are less likely to end up with your foot in your mouth yet again and so many red thumbs. “yet there were wiggly jiggly temperature lines on the map, shaded as if they had meaning”. OK dips**t … explain ! The “squiggly” bits might be related to an adjustment in the maps for altitude. You have stated there that you think the “Unajusted” AWAP maps show adjustment. As the AWAP maps are generated from these analyses are you claiming that the so called “unadjusted” AWAP analyses are really adjusted? Not sure what you are getting at. I said it looks like the temps the maps show are adjusted for altitude, that is why they sometimes appear to show the topology of the ground. You really do seem to be torturing things to include the term “adjusted” – have you been asked to do that by someone? I said it looks like the temps the maps show are adjusted…. Yes you did say that Harry. So why would I be asked to say something you said? Another one for the smoko room wall! 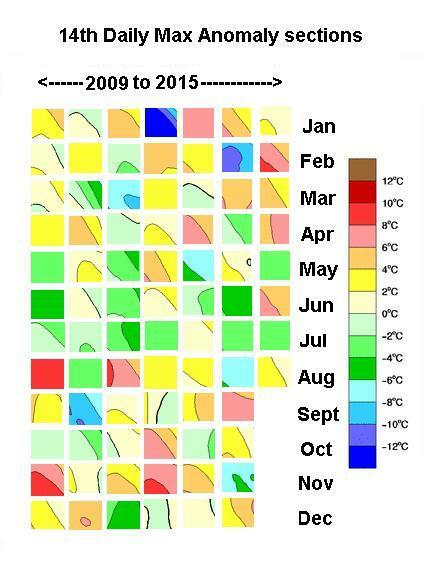 Great new Terminology of Climate Models by you & BOM Harry! And you are still nearly 19 years of WRONG predictions and still shading! Love your work Harry Shady! You should post a picture of this smoko room wall, it sounds impressive. 19 years of wrong predictions, care to elaborate? If only there was room in one posting… or 10,000 ! Of course they’re an approximation; they are so approximated they can be anything BoM wants. They can create records with them for instance; they can compare their approximated AWAP data with approximated and over-adjusted ACORN data to convince themselves and our hyper-ventilating politicians that we’re headed for the cooker. Politicians wanting leverage can pay BoM to fantasize their green-dreams. I’ve read the paper by Jones. They want to “improve” their climate guess-work by forgetting how sparse and inaccurate single-station real data are. The key to “better manage” Australia’s natural resources is for the Bureau to re-examine their own past published works, and stop bullshitting-us into the future. watching the Broncos celebrate their win, but want to comment re the BoM/Abbott revelations. none of the online coverage even linked to the Graham Lloyd articles, except for Jared Owens/Australian piece today, which links to an article behind a paywall. don’t think any included Graham Lloyd’s name, not even Owens below. Mr Hunt confirmed the question was raised with his department by Mr Abbott’s officials. Asked if the government would proceed with the policy, Mr Hunt told ABC Radio: “There are no plans from any discussions that I’ve had to change that law. We know that the challenge of getting it through the Senate is significant and so that will be, I expect, dealt with in due course. “Our focus here is to ensure that we have the highest standards, that as the world heritage committee found for example we are a global role model in managing the Great Barrier Reef and that what we do is we have high standards. Asked about the Abbott government’s aversion to wind farms, Mr Hunt said renewables were a “fundamental” and “appropriate” part of Australia’s energy mix and would consider allowing the Clean Energy Finance Corporation to invest in turbines. as for the public’s understanding of anything to do with CAGW, go to Hurst’s Guardian article and read the comments and weep (link in jo’s “rent-seekers” thread). You read well Pat, thanks. Slightly O/T but since this is about politics it is good to see Donald Trump knows how to play the game. He has come out stating very clearly where he stands on AGW ( he doesn’t buy anything about it !) and he brings this out at the very same time the Pope is making his comments. It will be interesting to see what the MSM do with his statements on the subject. Thankyou Fred. Clues to what data existed on old long records that go across 1910 helps. some of those you mntion will. Many old records should be on the BoM CDO pages but appear to have been shortened or are missing. Raw data records going back to the late 1870s make a mockery of AGW and the hottest year ever. Congratulations on a very informative study with nicely pictured visualizations rather than tedious lists of numbers or statistical graphics per norm! Thanks Bob. While it might seem that i had a good idea of how to display things. Am really just trying to show what i found and where i found it. Cut and paste ideas cam from Jo, Judy Ryan and Phillip Goode. Jo has put up with far to many edits, rewrites, upgraded pictures and rethinks with this. Videos may have been easier but this is a text blog with many visitors that prefer text. Taking up the point of your comment –I think Jo or Lance should send a copy of the work to the CEO and Chairman/woman of BOM. Ross, thanks for your comment but that’s not my point. CEOs and Chairs are management positions. The staff lower down the heirarchy, those who do the tasks set by the policies; the stats, GIS graphing and website technicians – aren’t they embarrased by the foolishness of how they earn a living? Surely some of them read here or Marohasy etc, and whisper about it among themselves. In years to come when they apply for other jobs their time at BOM isn’t going to look so good on their CVs. Fair enough Gary , I don’t disagree with you, but I think you’ll find a lot of public service people could be asked the same about their jobs. But they have mortgages to pay so they say nothing. Where no temperature stations are found. If [snip] has a face, this is it. Better to admit they don’t know (we used to write “no data”) than to [snip, create] a falsehood. Where is the outrage from the community of consensus believers? 1) are there other regions on the map with similar patterns? 2) is this obviously false data used to calculate other estimates e.g. Global temp? 2) A very good question that needs to be clearly and simply answered with just one of two words. Yes or no. 3) Is ACORN inheriting problems from AWAP? As an outsider , I am astonished at the “goings on” in the BOM, and I would hope that after all the research and findings made by Bob Fernley-Jones and Lance Pidgeon, that there would be at least some recognition and praise. However I realize that in this period of climate hysteria and down right nastiness that this is not going to happen. Here in America i think the situation is equally as perverse, our EPA , NOAA, and NASA institutions are riddled with individuals of the kind that now currently occupy positions at BOM. In the UK the situation is identical. In years to come when this period of controversy is over, people are going to ask questions of those involved. He was wondering how the Bureau of Meteorology could possibly create maps this detailed for specific days that long ago. I wonder if there is a law in Australia that prohibits the fabrication of data in or by government run institutions ? Perhaps a little over the top but this is all reminiscent of how the Chicago mob works isn’t it,they visit homes and small businesses extorting money for protection against an invisible threat when they are the one’s that people need protecting from, meanwhile in a cigar smoke filled room near you the mob leaders meet with AL ” capone “Gore baseball bat in hand,strolling around the table to where Tony Abbot sits ,and sat in the corner near the door taking notes is the mob lawyer Greg Hunt, dreaming up schemes to keep them out of the courts by rigging the jury of statisticians.Meanwhile outside the door knocking loudly but being ignored is Lance “Eliot Ness” Pidgeon and the FBI or “Feudaly Bypast Inhabitants ” of the Liberal party. PS in the end Capone was brought to justice via tax evasion and so maybe the best way to bring down institutions like the BOM is to follow the money to see were it leads . I’ts the new green jobs agenda. I’m just working my way through competencies that will allow me to sign up as the Political Officer on board the first of our new submarines – the AS (Australian Ship because it’s republic now) – the AS Bill Hayden (in honour of all those who were stabbed after him by subsequent Labor Prime Ministers). The AS ‘Bill Hayden’, it’ll crawl the depths sniping at conservatives only to surface when there’s a royal refit on offer. want to add that Jared Owens, when linking to a Graham Lloyd article, without naming him, doesn’t provide the headline either, which would help readers find jo’s website or others that excerpted/discussed it. tell me the MSM is not intentionally hiding Lloyd’s articles (and Lloyd?). 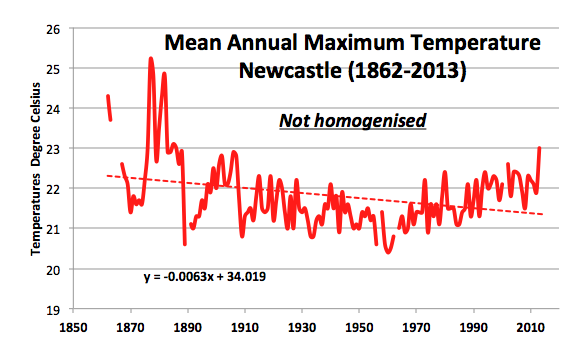 BoM – if the cold is “perfectly normal” whatever that is, and “bang on average”, how come we’re always being told it’s the HOTTEST EVER this or that? IT’S been a bleak couple of days but shivering Sydneysiders bemoaning the return of winter this week have, in fact, been enduring a ***perfectly normal September. Australian Bureau of Meteorology senior climatologist Agata Imielska says it’s not unusual for the mercury to fluctuate in early spring. A £1bn UK climate-change plan has been thrown into turmoil after the Drax power company said it was pulling out because government green policy reversals made it too risky to proceed. Several “critical reversals” in government support for renewable energy had made “a severe impact on our profitability”, said Peter Emery, the Drax board member chairing the group developing the White Rose carbon capture project. am no fan of Cameron’s, that is for sure, but his supporters had better watch his back! The oil group, Royal Dutch Shell, has teamed up with the McKinsey management consultancy and other large companies to advise governments on how to combat global warming without weakening their economies. The US-based World Resources Institute is another environmental group joining the commission, along with British economist, Nicholas Stern, and senior executives from the US Dow Chemical group, Germany’s RWE utility, and Norway’s Statoil. The Department of Energy and Climate Change said the record share of renewable generation reflected not only more renewable capacity, such as the construction of big new offshore wind farms, but also ***“more favourable weather conditions for renewable generation”. How long till the recognition that a bigger share of a vanishing quantity is a vanishing quantity? My first question was to ask how with one thermometer in such a large grid area, they can generate such detailed complexity in the contour lines? To get complexity yopu need data – which clearly they dont have. What proxy are they using to generate these complex maps? immediately links to “right wing” warns story. “It’s highly likely that the outcome from the Paris meeting will be a process for review of global and national targets, perhaps every five years, and that will prepare us for 2020, 2025 and 2030,” Mr Hunt said in an interview with Fairfax Media. too late Jensen. you are not to be trusted. as for the other presumably right wing “conservative”: as you are anonymous, you might well be a figment of the writers’ imaginations, for all we know. to the writers – what about all the non-right wingers like me who are CAGW sceptical & oppose all CAGW policies, including DA? But asked if the party’s right still had concerns about what Mr Turnbull might do, Dr Jensen said, “absolutely”. “It’s one of the conditions of the leadership change that we are sticking with the policy we had,” he told Fairfax Media. “It’s also in the [Coalition] agreement with the Nationals, as I understand it. “We fought a very damaging leadership contest on this very climate policy [in 2009], and we will now need to tread with enormous care, put it that way,” he said. Well Pat, it looks like it must have been a very close thing with the over turn of Abbott. For Turnbull to have to make these promises suggests he was scrambling for the final few votes. If you were in his position there is no way you would want to have to make these promises to his own colleagues. So as an outsider it seems to me either Turnbull has to be a very good politician to keep everything under control or there are still more fireworks to be seen in the next few months. I would bet on the latter as it doesn’t seem to me that Turnbull will be able to keep his ego in check. REALITY…BUT NO MSM COVERAGE WHATSOEVER. A looming federal budget confrontation and Republican hostility to UN global-warming talks threaten a U.S. down payment into a key climate-aid fund, money considered vital to a climate deal in Paris this December. President Barack Obama had requested $500 million in the 2016 budget for the first tranche of its $3 billion pledge into a UN-administered Green Climate Fund (GCF) that would help poorer countries make a transition to clean energy technologies and adapt to climate change. Tony de Brum, foreign minister of the Marshall Islands, said countries like his that will rely heavily on climate finance have no confidence that sum will be delivered. “The Americans always say: ‘You know how hard it is for us to deal with Congress on the budget.’,” said Ronny Jumeau, UN Ambassador of the Seychelles, a member of the Association of Small Island States negotiating bloc. FANTASY…BUT REPORTED SIMILARLY BY ALL MSM WORLDWIDE. EVEN WSJ’S HEADLINE WRONGLY GIVES IMPRESSION THE $3.1 Billion IS A JOINT CONTRIBUTION. Philippe Verdier, Head of Weather at France Televisions. I’m Philippe Verdier and I’ve been a weather reporter on TV for 20 years. In the last decade, I’ve been keenly interested in climate. I’m even the only weather reporter to have attended to all those conferences about global warming. Today, I can say there is really no relation anymore between climate – what it concretely is –, and what you are told about it. We are faced with an incredible hodgepodge made of scientists, politics, economical lobbies, green NGOs, and now – this is something new – religions. There is an unprecedented hype about climate. As the conference will happen in Paris, the organizers, the UN and the government need to give consistency to the matter. For that purpose, they will do absolutely anything. As a result, we don’t get anything anymore. Climate has become a totally artificial subject driven by a diplomatic and political agenda. So I’m going to rat everything out. selling CO2 EMISSIONS TRADING to the developing countries! LOL. Alex Evans is a senior fellow at New York University’s Centre on International Co-operation, where he focuses on international development, climate change, and global issues, with a particular focus on the post-2015 development agenda. He also co-edits the foreign policy website, Global Dashboard. Alex’s recent work includes helping Gordon Brown with his forthcoming book on the world in 2025, advising Unilever CEO Paul Polman on his membership of the High-level Panel on the Post-2015 Development Agenda, and acting as lead writer for the UN’s 2011 High-level Panel on Global Sustainability. He is based primarily in Ethiopia, but travels regularly to New York and the UK. Before that, Owen was a British civil servant in a career spanning more than 20 years. He worked worked at the UK Department for International Development, as Director of International Finance and Development Effectiveness, Director of Communications, Information and Knowledge, and as Head of Africa Policy Department. His roles included being Private Secretary to two successive Chancellors of the Exchequer, coordinating the public spending system, forecasting the world economy, forecasting and analysis of domestic labour markets, and medium term macroeconomic policy analysis. From 2000 to 2004, Owen was a non-executive director of OneWorld, a not-for-profit whose mission is to promote the use of the internet and media for the benefit of the world’s poor. Well done Lance, this just could be the find that tips the balance. I was worried that if we ever got rid of Acorn we’d end up with AWAP- thanks to you this is unlikely. Great evidence that our temperature history is junk. you may recall in July, this Guardian headline: “Vatican ‘may’ consider divestment from fossil fuels, despite pope’s call to arms” in which a spokesman for the Vatican bank, Max Hohenberg, claimed the issue was largely irrelevant because “there really isn’t much to divest”. On Monday, 81 campus and community groups from around the world signed and sent a letter to Pope Francis in support of raising awareness of fossil fuel divestment. College and Cornell University have also had campus groups sign in support. That gif is great Wazah! - does the altitude of the land topology change over time? - what happened to the number of stations starting from the 1950s? - has the analysis been done for an area of Australia that may have had better temperature measurement for a longer period of time eg the populated areas of the east coast. Compare that with the area analysed in the article, the area out in the desert with a small number of measurement stations spread over a large area. 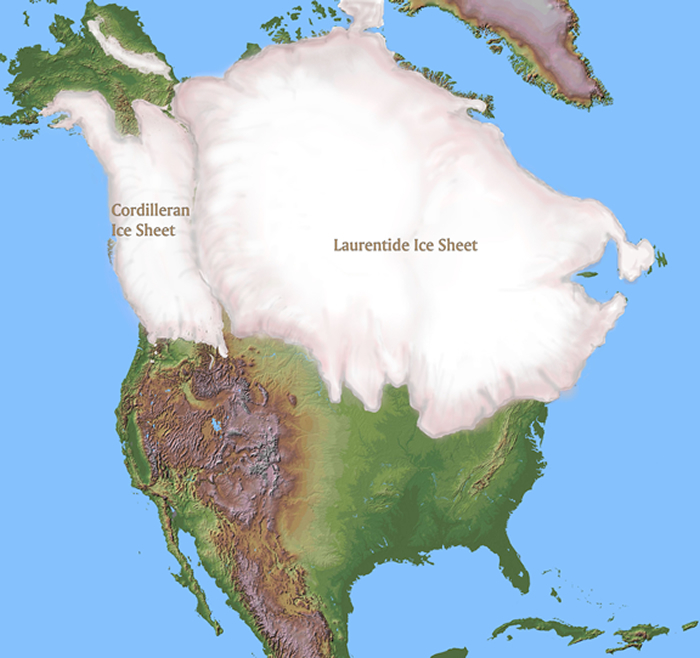 - why do people care about temperature maps using data from before the 1950s? Because that all the alarmists have to create their alarm. !! The satellite data shows ABSOLUTELY NO CO2 WARMING IN THE WHOLE 36 YEARSOF DATA..
Around 1940 was a very warm period, but the deliberate cooling of the temperature record oof that period, just because it was “inconvenient” to the AGW lies, is a deceit that cannot go unanswered. Apart from that solar induced warming and step El Nino, there is absolutely no warming in the whole of the satellite record.